Corporate Lawyers are specialized in corporate laws, whose responsibilities usually consists of advising companies on their legal duties, counseling clients, ensuring the legality of commercial transactions, and handling business transactions such as drafting, negotiation, contract reviews, and other agreements related to company acquisitions, mergers, and divestiture. 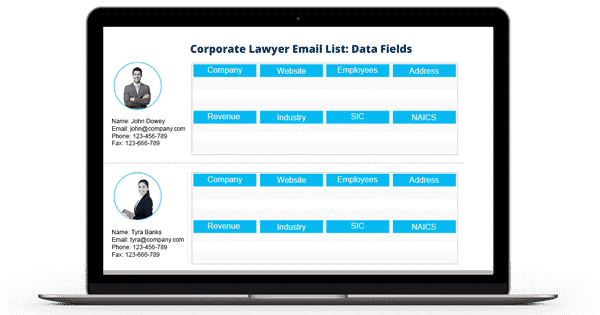 A firm commitment to accurate data makes Blue Mail Media’s Corporate Lawyers Email List stand apart from other business lists available online. We understand the importance of segmented data for your marketing operations and therefore provide you an option to customize this database. Besides, we strictly follow the guidelines of Anti-Spam law and GDPR. Hence avail our comprehensive email list that helps you to achieve the desired result with no hassles. The Blue Mail Media’s Corporate Attorney Email Database consists of records of corporate lawyers from all over the globe. The data we provide in our list is sufficient to execute email, postal and telemarketing campaign effortlessly. We have sourced the information for our email list from a multitude of sources including B2B directories, trade shows, job portals, yellow pages, and more. All these data undergo rigorous verification and quality checks before sending it to you. Therefore, you do not have to presume about its authenticity anymore. Besides, our list comes with a customization option that lets you target individuals of your interest quickly. You can also target the prospects residing in various other parts of the world without spending much of your time. The places include North America, Asia, Europe, Australia, Africa, New Zealand, the Middle East, and South America. Many organizations selling high-value products and services are already using our Corporate Lawyers List to run their campaigns. Our 100% tele-verified and email-verified list helped them to boost the conversion rate and ROI in a short period. Avail our robust Corporate Attorney Mailing List that supplies all the updated and verified information of your prospects. You can dial 1-888-494-0588 or email us at sales@bluemailmedia.com to inquire more about our list.